Members of the Nature Play Group from the Peninsula Environment Group have called on Central Coast Council to justify the use of a scheduled herbicide in the “drainage easement” adjacent to Neera Rd, Umina. Glyphosate 360 herbicide is a water-soluble herbicide for nonselective control of annual, aquatic and perennial weeds. Instructions for its use said: “Do not apply this product within 0.5km upstream of potable water intake in flowing water (rivers or streams) or within 0.5km of a potable water intake in a standing body of water such as a lake, pond or reservoir. Although proposed use adjacent to Neera Rd is not near a drinking water supply, members of the Nature Play Group have questioned whether its use is safe in an area so close to an area of beach and creek mouth preferred by the parents of young children. Safety directions indicate the product will irritate the eyes and skin and that contact is to be avoided. Users are directed to wear elbow-length PVC gloves and face shields or goggles. “After use and before eating, drinking or smoking, wash hands, arms and face thoroughly with soap and water. “After each day’s use wash contaminated clothing, gloves and face shield or goggles. “When using controlled droplet applicator wear protective waterproof clothing and impervious footwear.” Chemical company Monsanto introduced Glyphosate to the market in the 1970s under the trade name Roundup and the company’s last patent expired in 2000. Its toxicology and safety for humans remain a topic of debate. According to members of the PEG Nature Play Group, other local governments have stopped using it in favour of safer chemicals. 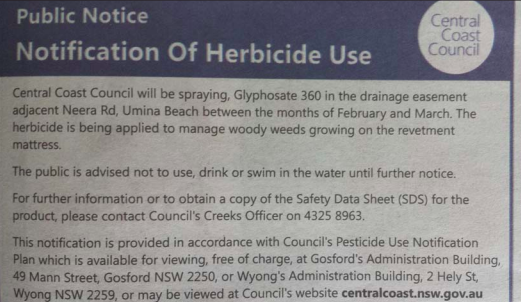 Cr Richard Mehrtens said he was disappointed that Council staff considered a notice in a regional newspaper adequate to inform the local community and visitors about the use of the herbicide. “Perhaps through the consultation Council currently has underway to get feedback from the community about its engagement strategies, they will find improved communication methods for such important safety information,” he said.